Scanned documents always require post-formatting due to blank pages, wrong paper sheets orientation, big scanned files size, etc. With Tiff Pfd Cleaner you can deskew scanned images and do all these arrangements with ease. This program also can convert scanned TIFF to PDF files and vice versa. A huge bonus is ability to perform all these actions in batch. This means you can process all scanned PDF or TIFF files together. In order to deskew TIFF files in batches you need to select all scanned sources for processing. Just check off scanned files in the list and press on the icon of required format - TIFF. You will see the list of options popped up. 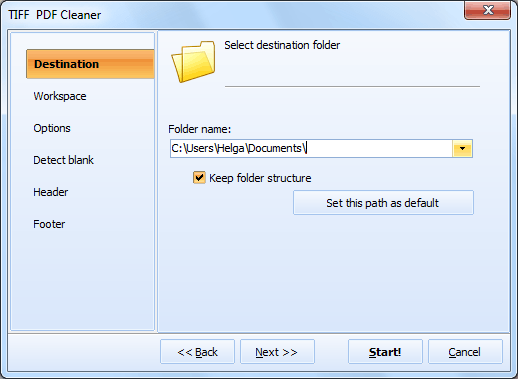 There you need to setup all parameters for cleaning and formatting scanned images. Please note that Tiff Pdf Cleaner has adjustable blank pages detector. You can change its sensitivity depending on the quality of scanned material. This option is necessary when you decide to split scanned files by blank pages. 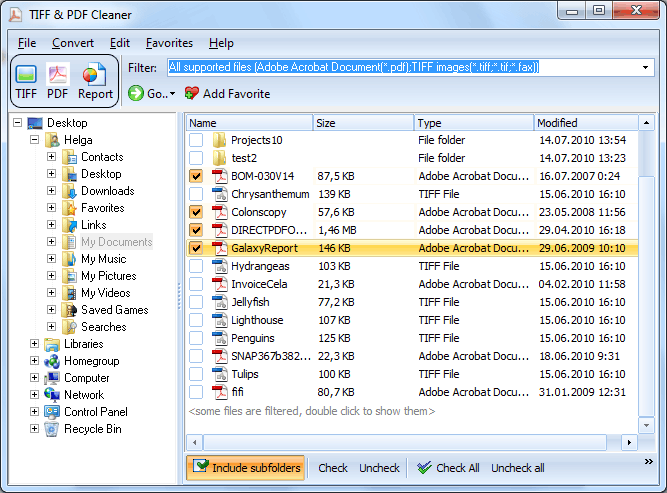 Tiff Pdf Cleaner helps to avoid any data loss. For this all pages detected as blank can be saved to a separate document for further review. Additionally you can crop scanned pages to remove extra frame. The program automatically defines blank space from the sides of each scanned image. Scanned TIFF images can be compressed by one of supported methods or left uncompressed. There is a command line support for processing scanned files from the console. You can deskew TIFF files by one command, setting all parameters in text. 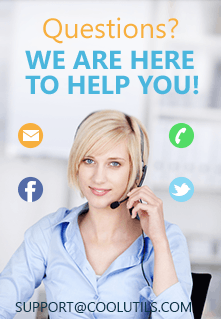 Try Tiff Pdf Cleaner now!